the speed is zero for around 1 second. The clutch pedal is released. the vehicle speed is less than approximately 7 mph (3 km/h). on the instrument panel is lit when the engine is on standby. Before getting out of the vehicle, you must switch off the ignition by pressing the engine stop (please see “Starting, stopping the engine”). the accelerator pedal is pressed. the engine is in gear and the clutch pedal is pressed right down. To fill up with fuel, the engine must be stopped (and not on standby): always stop the engine by pressing the engine stop button (please see “Starting, stopping the engine)”. on the vehicle, the message “AUTO STOP UNAVAILABLE” appears on the instrument panel indicating that engine standby is not available. With the engine on standby (traffic jam, traffic lights, etc. ), if the driver unfastens their seat belt, opens the driver’s door or gets out of their seat, the ignition will be switched off. To restart and reactivate the Stop and Start system, press the start button (please see “Starting, stopping the engine” in Section 2). In the event of an emergency, the engine can be restarted by pressing on the clutch pedal if the Stop and Start function is activated. Press switch 1 to deactivate the function. The message “Stop & Start deactivated” will appear on the instrument panel and the integrated warning light 2 on the switch will light up. 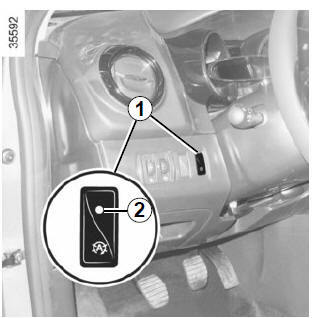 The system reactivates automatically each time the vehicle is started using the start button (please refer to “Starting, stopping the engine” in Section 2).